Ok, so I loved this New Victoria that Lia Habel has created for Dearly, Departed, She has such a well thought out history of why the world went back to this era after all the bad went down. You get to see everything to were people live and why they live there according to their station in life (yes this is set in the future). I thought the setting was a very original concept in contrast to the year. I thought the same of most of the characters in Dearly, Departed. I loved Nora Dearly! She goes to the right school, has the right family, and she does not care one bit what society thinks of her. Nora has been in morning over her father’s death for a year and is still hurting from it, but when she has to go home to her aunt who is non-sympathetic she stands up for herself. Even though Nora is small and always dressed like a lady, when trouble comes her way she fights like there is no tomorrow, how could you not love her. When Nora meets Bram her world is turned upside down. I all kinds of fell for Bram! This zombie is everything you want in a man…Ok so he is stitched up in a few places, but he is still hot! There is this one scene when Bram is trying to make Christmas special for Nora, it will melt an undead heart. As much as I loved the zombies, the setting and the storyline itself, I really did not care for the POV change every chapter. It just didn’t work for me in Dearly, Departed. If it had just gone back and forth from Bram and Nora it may have been fine, but I didn’t find the villains in the story that compelling so their chapters didn’t keep my interest. 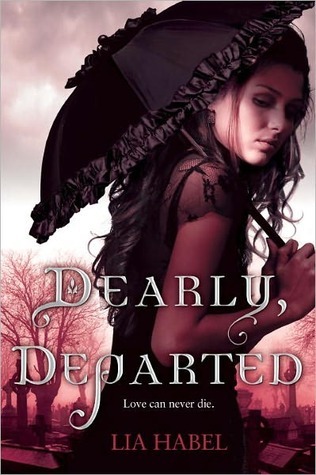 Overall I enjoyed Dearly, Departed I am very excited for the next in the series Dearly, Beloved. It's good. I had fun for the most part. Teen and up: For language, and violence. Re: the POV changes -- I said pretty much the same thing in my blogpost. I don't typically mind alternating POV's, but I think in this case (were I to change anything) I would prefer it being only Nora and Bram. Other than that, I thought this book was SO charming and SO fun. I loved it! And I loved the cover so much. I'm also excited about the next in the series. Loved your thoughts. Wait-what? Next in the series? Oohh... That's such great news! Okay, actually I've yet to read the first one (cough, cough, it's first thing on my wishlist) but after checking out the reviews it has overriden my initial reticence of a zombie as a paramour. And now I'll be back to speak properly. Like someone from this century. POV complains have also been quite common. I usually like the switch, but I think you nail it when you said that the villains weren't interesting. If you want the thing to work, everyone needs to be equally developped! Anyway, thanks a lot for the review! First, thank you for dropping that NetGalley has offered copies. I liked type-smashed the keyboard in my anger, and then ended up spewing trashy cuss words.